This is a busy week in Galway road running. As well as the highly anticipated first race in the Galway 5K series which is on in Athenry on Tursday evening, (http://www.athenryac.com for details) , Race 3 of the handicap series is due on Sunday morning, 14th May. Though we encourage people to take part in both events, depending on your level of fitness it might be advisable to use one of the races as a training run if you are hoping to do both. A 5k race sounds easy after all the 10k's you have been doing, but be warned that shorter races are often much tougher experiences due to the higher tempo! Your legs will likely hurt more after a 5k than a 10k! 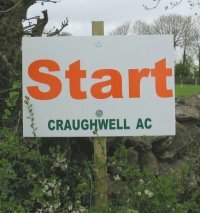 The Craughwell race on Sunday is the probably the better one to use as a training run, since it is a less competitive race. If you have a target pace in mind, you can tell this to the man at the start and we will let you off earlier for your slower-paced run (give him plenty of notice!!). Points gained in such a training run will not count towards prizes at the end of the series. Also, if you have a handicap > 1 hour and are not planning on running the next race could you let us know as this will make administration a bit easier for us (and give Michael an extra 30 minutes in bed!!!). The handicaps for the next race are below.